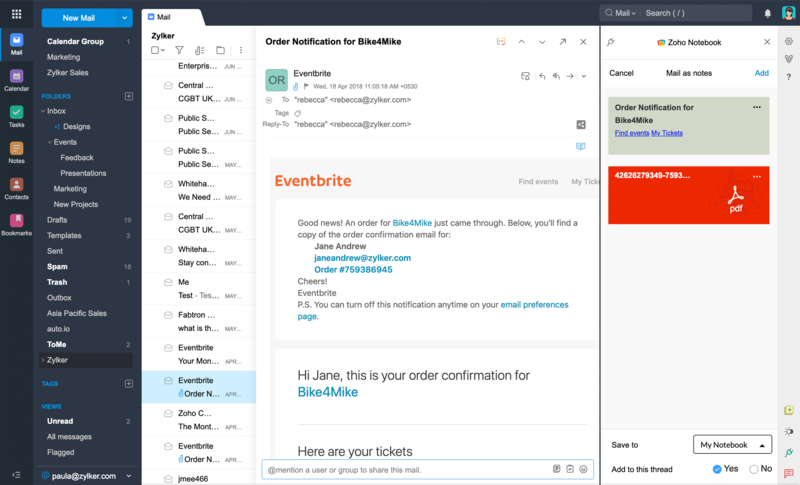 Today we’ve got a new Notebook integration for you, this time with Zoho Mail. Now you can access your notes straight from your mailbox. 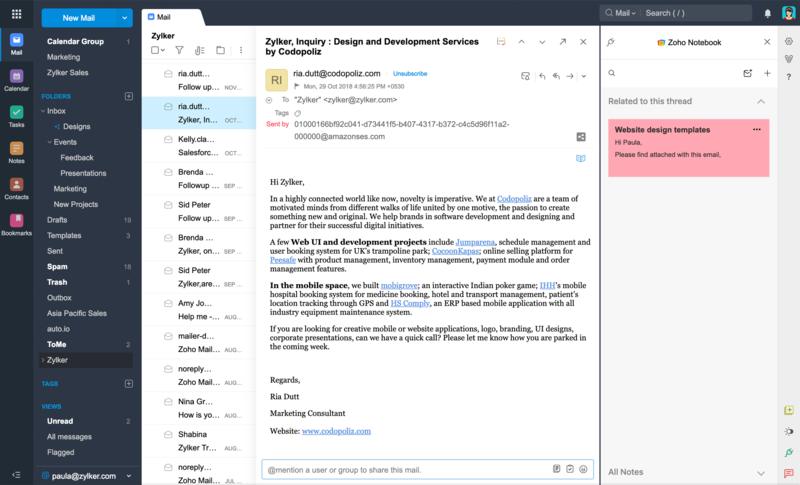 Even better, you can email your thoughts, turn your emails into notes, associate notes to email conversations, and more. 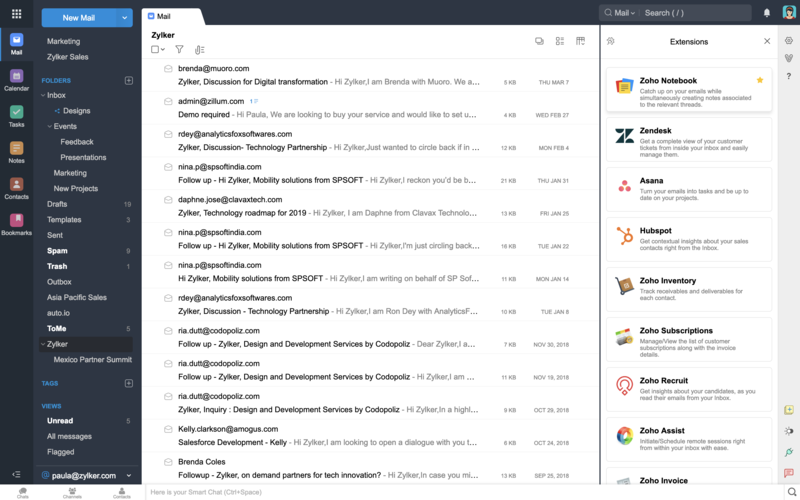 We think the value is clear: it’s better to have Notebook within Zoho Mail, rather than have your notes in another tab. With this integration, you can instantly get a note card’s content into the compose mail section. Emailing your thoughts, ideas, and plans has never been this easy. To send your thoughts to your loved ones and peers, choose a note, click the three dot icon, and select Compose Mail. Have you ever spent way too much time looking for an email? Thought so. Now you can save important emails as note cards so you can view them anytime without searching through your inbox. From an open email, simply click on the Create from email icon in the Notebook widget. 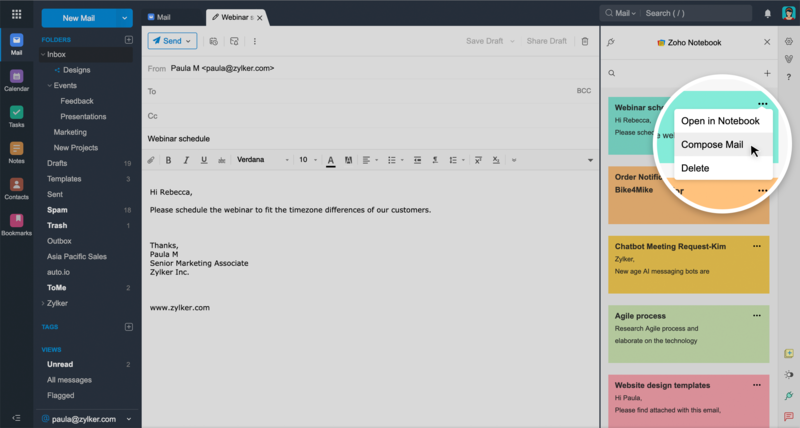 You can even turn an email into a note by dragging and dropping it from your inbox into the Notebook widget. Let’s say you get the details of a meeting in an email conversation. Now you can make a note of that in a note card, then associate that note with the original email thread. And, when you need to remember the time of the meeting, you can click the thread to see the related note. To associate an email to a note, select a mail thread, click the three dot icon on the note card you want to associate with it, and choose ‘Add to thread’. We hope that you try and enjoy Notebook in Zoho Mail and share your experience with us. In a future update, you’ll be able to open the associated emails with a single click from your Notebook app. In the meantime, we’ll continue connecting Notebook with your favorite applications. You can also help us by sharing your ideas for other interesting integrations with Notebook.